I was reading an article about quantum mechanics and how many scientists in the field want to find a definite reasoning for the whole “Spooky action at a distance,” where two particles can be quantumly entangled, causing changes to one particle to affect the other, regardless of the distance between them. So I began to think about this. I imagined the universe as a simulation program, exposing basic building blocks into the simulator that everything was built upon, so tiny in comparison to anything the developer would expect to grow or evolve in the simulator. The developer powers it on, watches for a bit, goes to grab a cup of coffee, and checks back periodically. Perhaps he even interferes just a bit in the affairs of the simulated life inside the system, and then goes away for a while. Now at some point the “life” in the system gets curious and starts heavily investigating those basic building blocks. So far the simulation has been pretty stable, but now the basic building blocks are being messed with, poked at, accessed in ways that weren’t intended. And like any software, there’s bugs. The lifeforms in the system manage to get two of these objects to entangle with each other. They marvel at the fact that the objects are still somehow linked even across great distances. To the developer, this wouldn’t have been that surprising. Afterall, they’re just two objects with various properties, and location is just one of them. Perhaps they’re even designed to share certain types of data for memory optimization reasons, and they don’t sanity check locations between linked objects for performance reasons. It may not matter that much to the developer, but it certainly managed to confuse the lifeforms in the system poking at the objects. Fortunately it appears safe, but they’re poking at a whole lot of different things that weren’t meant to be exposed, and no program is bug-free. So pretend for a second that this was the case for our universe. None of us had any idea how true this would be. Aside from one person, perhaps — The Terror on Amtrak Bus 3717. Half the people on the bus heard his words, but most paid no attention to it. Just a common jokester messing with friends, some of us thought. It wasn’t long, though, until someone began to panic and called out for the driver. There was a loud scream. The bus came to a sudden stop and the lights flashed on. Everyone turned to look at the back of the bus. The crazed man was repeatedly punching an older lady in the face as her daughter watched in horror. Without hesitation, four men jumped up and pinned the attacker down. Two held on to his arms, holding them such that any movement would cause the arms to twist painfully. The third had a hold of his feet, while the fourth had a grip on his head and neck, strongly hinting that he would gladly snap the neck if the man dared struggle. The victim’s face was covered in blood and the daughter was crying with fear. Seeing that the man was restrained, the bus driver immediately called for the highway patrol. 10 minutes went by, though it may as well have been hours. Eventually, the police pulled over and stepped onto the bus. Two went to the back and cuffed the crazed attacker, while a third attended to the lady. The next hour and a half was a blur of testimonies, uniforms, and contact information exchange. By the end of this, we learned two things. There was already a warrant out for his arrest. Finally it was all over. The assailant was gone, people had been let off at their stops, and the lady was deemed “well enough” to avoid an ambulance trip. Remember, boys and girls (especially the girls). Make sure that when riding a bus, you sit as close to the front as possible. It’s far safer and gives you more protection against the hidden terrors that lurk in the shadows of the back of the bus. Another year come and gone. Hopefully everybody is out having a good time or recovering from a good time. I just finished up for the night and am planning to get some reading done before bed, but thought a quick blog post summarizing the year was in order. This year marks my second year living in the Bay Area and working at VMware, and my first year really heading up some larger projects. I began the year by working on what would in time be known as VMware Server, and spent the first half of the year head down at my desk working on each release. Following that, I’ve been working on specifications, feature implementations, and even Tango-style icons for VMware Workstation 6.0, which I will continue with for some time. Jamie and I have now been dating for just over two years. For the first time, I was invited to FooCamp, hosted by Tim O’Reilly. Awesome event that I really hope to be invited back to next year. I learned to boogie board with a couple of friends in Santa Cruz. 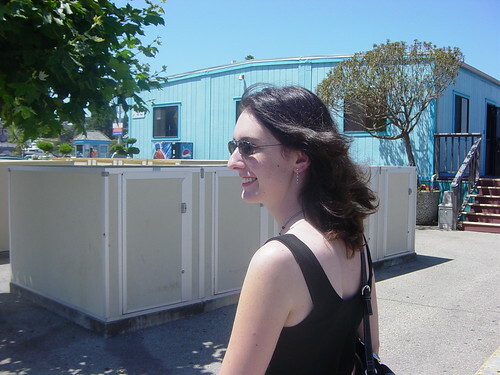 Later in the summer, Jamie and I took a nice vacation in Santa Cruz and spent most of it at the Santa Cruz Beach Boardwalk. I had my second trip to Boston this year for the GNOME Summit. I went with Jamie to Salem and explored the touristy little town. Fun place, and I’d definitely like to spend more time there in the next couple of years. I went with some friends to Castro St. in San Francisco for the first time for the big Halloween costume party that they have every year. We found out the following day that there was a shooting not too far from us, which was unnerving. I got a Nintendo DS and a Wii, and have spent far too much money on both. I’m going to just start signing over my paychecks to Nintendo. Now, New Years Eve doubles as my mom’s birthday, which I imagine was not fun when growing up. I think the only day worse for a birthday is Christmas. It was certainly fun tonight, though. The night was spent with my mom, stepdad, brothers, sister, and Jamie. We watched Cars and played Scrabble, Bomberman Touch! for the DS (fun game! ), and Cranium. We ended up spending most of the evening on Cranium, which has to be my favorite family game. We kept laughing so hard that we got ourselves sick. January 1, 2007. With any luck, this year will be more exciting and eventful than last year. There are changes I hope to make, projects to abandon, projects to take up, and places to go. I think I’ll get some sleep so that I can get a head start on that. My girlfriend Jamie and I took a vacation to Santa Cruz. We both were looking forward to getting away from work and everything else and just relaxing for a few days. And relax we did. The trip was a blast, and like any good vacation, it went by quick. We spent most of the first evening just getting settled into our hotel. 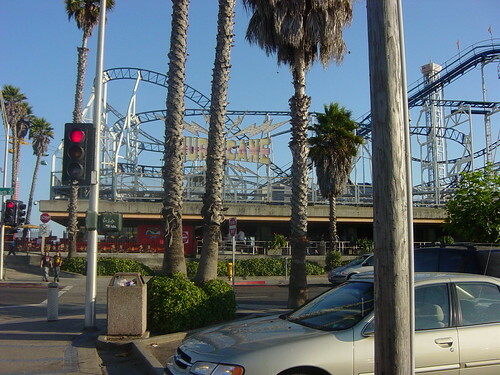 We took a trip to the Boardwalk, which was only a couple blocks away. I had been there once before for the Workstation 5.0 release party, but a lot of it was closed off, so I didn’t realize just how big it was or how many rides were there. Jamie had never been there before, so this was in many ways a first for both of us. We bought a 60 ticket sheet, which we later discovered may not have been the best investment. We expected to only be there for one day, and didn’t think the rides were as expensive as they were. Ah well. It turns out that on Mondays and Tuesdays after 5PM, the rides were only 1 ticket, so we did get to go on several before turning in for the night. On the second day, Wednesday, we went to this little restaurant called the “Beach Street Cafe.” While the food was good, the service left much to be desired. It took forever for them to even acknowledge our existence and seat us. After breakfast, we hung out at the boardwalk and used some more of our tickets. 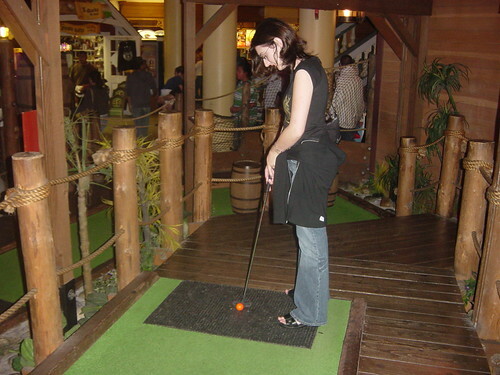 We played miniature golf a couple of times and played a round of laser tag. It was a long, exhausting, but fun day. We found out that on Wednesdays and Thursdays after 5PM, unlimited ticket bracelets dropped from something like $28 to around $8, or something like $13 for one that included two free things like mini-golf and laser tag. We each got the $13 ticket bracelets, which we used for one of the mini-golf rounds and laser tag. Mini-golf was a blast. The whole thing took place in this pirate caverns place. We haven’t played in years, so we were both pretty bad, but not as bad as we expected. Jamie was doing pretty good for a lot of it, once she warmed up. We kept score the first time, but decided it wasn’t worth it the second time, especially since we were trying to take pictures and didn’t want to hold up the people behind us. The third day, Thursday, we rented a couple of wet suits and boogie boards and went to Seabright, a nice beach right next to Twin Lakes Beach. We were practically inbetween the two I guess. 20 feet away from Twin Lakes. The walk there was long and painful, as we kind of underestimated the distance and started off taking the long way around to there. There weren’t that many people on the beach, which was nice because we expected to make fools out of ourselves. 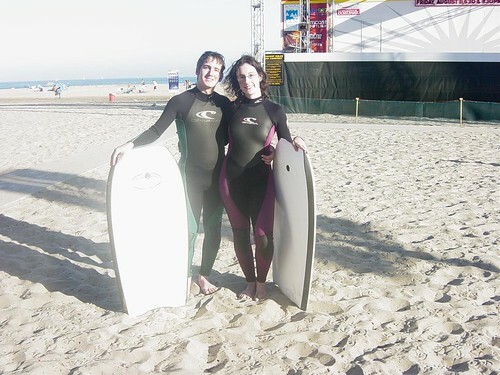 This was my second time boogie boarding, and I loved doing it, despite some minor injuries that resulted. Basically, I was hit by a wave and the board stuck in the sand, while my gut smacked into the top, knocking the wind out of me. It hurt for a bit, but there were no major injuries. Jamie had never gone boogie boarding before, but I talked her into it and except for this one wave that took her by surprise, she enjoyed it too. We spent some time relaxing on the beach and making sand castles/pyramids. We were there probably 4 hours or so. Then we begun the long walk back. We then proceeded to go back to the Boardwalk for some more fun. On the fourth day, Friday, we decided to buy souvenirs and go on a few more rides. I bought a pirate hour glass, a whole bunch of shot glasses, a towel, some Santa Cruz poker chips, and probably some other stuff. There was a store there getting rid of a bunch of their inventory and they said we could name the price on several things, so we bought up a bunch of half broken and useless junk 🙂 Some of it was nice, though, and very fixable. On Saturday, we went home and attempted to relax, exhausted after our busy but extremely fun trip. Update: More pics available here. I know this is temporary, but it’s frustrating because there really is a lot of cool stuff I’m looking forward to working on. Some may say to enjoy it, take a break, play some games. Problem is, I don’t even feel like doing that! 😛 Perhaps after work calms down and I’ve spent long enough doing nothing at home, I’ll have more motivation to code. How do other people usually deal with this? Okay, I don’t know how big it is, but I’m 22 today! Now I can, um, get drunk? No, that was last year. Hmm. Okay, so 22 isn’t special. It’s just one day closer to 30. Still, today should be a very fun day. My girlfriend is coming to visit, I have some presents to open, and I bought some good movies to watch. Yesterday was fun as well. My team at work treated me to sushi at my favorite sushi restaurant (Fuki Sushi). We sat in one of those Tatami rooms (where you take your shoes off and sit on the ground), which I’ve always wanted to try. Later we played Tetrinet for a bit, and then I took off with my dad. We got some dinner, watched Sahara, and then called it a night. I’ve spent most of today looking online for old Zelda and Mario comics. I’m quite pleased to find a large selection of scans 🙂 If anyone has any resources for Mario comic scans, I’d love to see them. For all those people who just love me so much and have nothing better to do with their money, I’ve posted a small wishlist up 😉 You know you want to. And now it’s about time to take off and meet my girlfriend at the train station. Wow. Today (Sunday, Nov. 27th) is Jamie and my one year anniversary. How time flies. It doesn’t feel like more than a few months ago that we met and nervously started going out. Unfortunately, I spent the day travelling back home (I was visiting for Thanksgiving), but we had a nice lunch and dinner yesterday, and she’ll be coming to spend some time in a couple of weeks. And despite the annoying distance, we’re still doing just fine. Yay, go us!